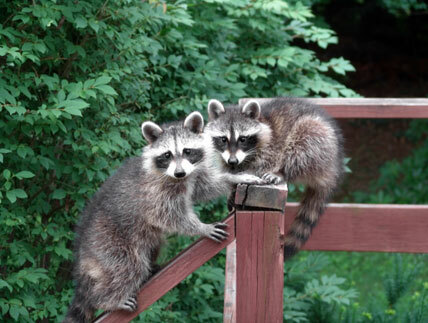 Electric fences are perfectly suited for protecting your house from raccoons! When it touches the electric fence, the little bear receives an electric shock that is not dangerous to them but scares them enough that they avoid the building in future. By fencing off the house and entry points to the roof, raccoons will have no chance of getting back into their den and will quickly search out somewhere new. At electric-fence.co.uk, we specialise in electric fence systems that have been developed with raccoon and marten control in mind. Depending on the situation, we offer a variety of products that you can use to reliably secure your house, garden or carport. The heart of any electric fence system is the energiser. The positive / negative principle is used to get around the problem that a normal electric fence system only works when a good earth connection is available (topsoil, moist ground, etc). The impulse flows through the animal to the ground and then through the ground back to the energiser. Poorly conducting fence bases, e.g. wood, stone or plastics, prevent an effective shock being generated as these act as insulators between the conductor and the ground and so no electricity can flow. This problem also arises when installing electric fences onto pre-existing screen fences, carports or gutters, as is often the case when dealing with raccoons. We can, however, get around this problem by placing several parallel wires according to the positive / negative principle. These wires are separated by a distance that is too small for the animal to slip between them without touching both. The wires are alternately connected to the ground and the fence energiser. When two wires are touched at the same time, the shock can flow unhindered from the fence wire (positive) through the animal and into the ground wire (negative). This type of design provides a very good deterrent effect. Raccoons are excellent climbers, but cannot jump. Raccoons weigh around 10 kg and any electric fence must be able to handle this kind of load! These animals are mostly active during the night and leave their sleeping place then, therefore, between dusk and dawn is the best time to install an electric fence. Avoid taking any action to shut out martens during the breeding period from April to July so that the helpless baby animals do not become separated from their mothers! 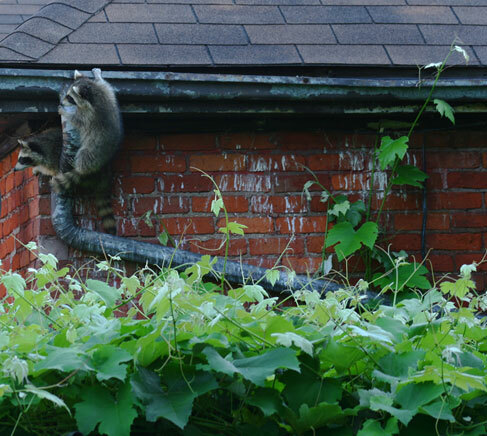 Installing this patented gutter insulator is a simple way of blocking off the raccoons' most popular entry point. 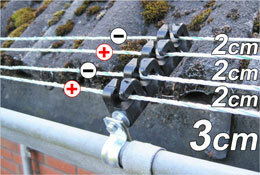 These insulators are easily clamped to the gutter bead and securing using screws. No drilling is required, and your gutter remains intact. Normal orientation for the gutter insulator is around 45°, but this can be adjusted depending on the exact circumstances. 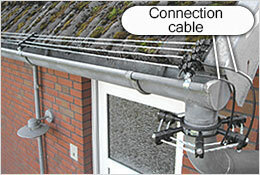 We recommend the 4-wire gutter insulators (item no. 46010), as these provide the best cover for the whole top side of the gutter. Place an insulator about every 1 metre along the gutter to ensure best stability of the fence. Before mounting the anti-raccoon insulators, clean out the gutter, removing old leaves and sticks, in order to prevent short circuits. Short circuits would not be dangerous, but would reduce the effectiveness of the fence. For defence against raccoons, the VOSS MiniSafe Protec with 230V mains connection (item no. 30902) is the energiser of choice! The lower voltage is safe for people and animals, yet provides the necessary deterrent effect to keep raccoons away permanently. This energiser is weather-resistant and its compact size and simple operation make it perfect for those who have little experience with electric fences. Insurers recommend installing a ground fault circuit breaker (item no. 48015) when using mains energisers in the home, yard or garden. This is placed between the energiser and plug socket. The energiser is instantly turned off the moment any fault currents are detected. Fault currents may be caused by defective cable insulators or moisture damage. Using a ground fault circuit breaker will avoid any accidents involving electricity. If you don't have a 230 V mains connection available, then we recommend the 9 V BV3900 battery energiser (item no. 42030). This is also very compact, simple to use and operates using standard 9 V dry batteries. An integrated voltage regulator means 12 V operation is also possible. Polywire (e.g. item no. 42405) is the best material to use for guiding the current through the insulators. Polywire item no. 44645 has an incorporated copper conductor and is therefore highly conductive, extremely robust and therefore offers great protection! Its neutral fir green/white colour and ease of use make it perfect for use around the house, yard and garden. For small areas, high-grade steel wire is also an option (item no. 44572). This is slightly less conductive than the polywire, but it's very robust, long-lasting and almost invisible. It is extremely important that the cabling between the energiser and the fence is undertaken with care. The connection to the energiser is made using a high-voltage cable (item no. 32615). The positive terminal (pulse supply, fence connection) and negative terminal (ground connection) on the energiser are connected directly to the conductor. None of the conducting wires may be grounded when using electric fence systems attached to buildings. Some providers break this rule and connect the electric fence system to the ground using the gutter, for example. 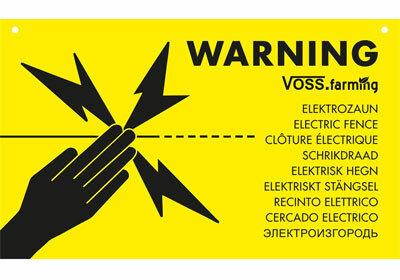 This can result in dangerous electrical accidents occurring! When making repairs or extending the fence, use a connector (item no. 44751 or 44684) for both the connecting cable and the wire. Using a connector prevents a drop in voltage at the transition points and creates a solid mechanical and electrical connection. The connectors further protect the conducting material from wear and make it much easier to re-tension the fence at a later time. Using a fence tester you can quickly and reliably determine how well your fence system is working. Digital testers are especially convenient (item no. 44863). To ensure an effective deterrent, the operating voltage should be at least 1000 V.
For safety purposes, lightning protection equipment should also be installed (item no. 44880). This will prevent lightning strikes from affecting your energiser during a storm which would otherwise lead to irreparable damage. If your energiser is installed inside a building, then lightning protection may be legally required in accordance with your local regulations. The lightning protection mechanism is installed between the energiser and the conducting fence material on both connections. First mount the lightning protection mechanism onto a non-flammable surface near to your energiser (e.g. on the wall of the house). Next, connect it to the energiser's fence connection using a high-voltage insulated fence supply cable (item no. 32615). The other part of your lightning protection mechanism is also connected to the fence conducting material using a high-voltage insulated fence supply cable. Now you just need to connect the grounding. For the ground connection you should ideally use a galvanised steal core lead out cable (item no. 32601). Use this cable to connect the lightning protection mechanism to the grounding post (item no. 44219). Our new dual lightning protection mechanism is perfect for use with systems set up in the positive / negative layout (item no. 44880). 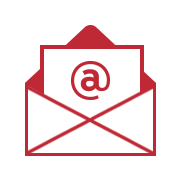 To ensure complete long-term protection, you should leave the system in operation 365 days a year. The scent trails left by raccoons on your property can last for decades and work to attract other raccoons in the future. The fence should remain in operation to keep out these future martens too. At current electricity prices (2016), running this kind of electric fence system at full load will cost around £ 8/year. This amount is significantly less than the cost of the damage that raccoons can cause. Raccoons often use the drain pipe to get up into the gutter. The best protection in this instance is provided by our patented drain pipe insulators (item no. 46020 and 46021). Just like the gutter insulators, these can be attached by hand without the need for any drilling that would damage the drain pipe. The pulse carrying conductors on the outside will make it impossible to climb over the insulators. The clamp goes all the way around the pipe and a rubber base guarantees it won't slip out of place. The route to the roof is now secured against any climbing creatures. We have two different diameters available for different drain pipes (87-92 cm and 102-106 cm). If neither of these fit your drain pipe, then you can use an insulating band or pieces of wood to line the pipe to the right diameter. The rest of the system is assembled the same as for the gutter. The drain pipe insulators can be combined with the gutter insulators (item no. 46001 and 46010). You simple need to connect the conducting wires. This is easily achieved using a connector and a high-voltage cable (item no. 44751 and 32615). Please also make sure that none of the conducting wires on the drain pipe are grounded! High-voltage cable (item no. 32615). Fence supply cable (item no. 32615). 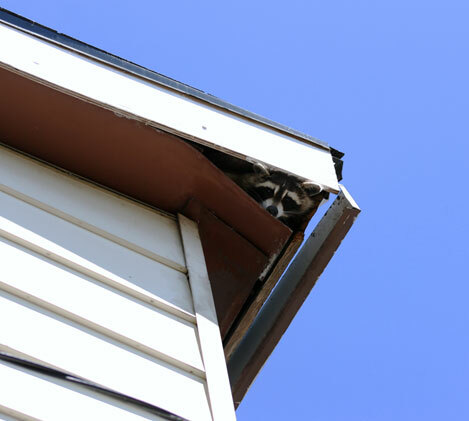 Walls with a rough finish or walls with recessed joints are easy for raccoons to climb. For these situations we provide special insulators with guides for 6 parallel wires 3 cm apart (item no. 44927 and 44928). These 6-wire insulators have a metric thread and are easily screwed to any available metals, plastics or ideally to our universal mount (item no. 46150) with base plate (item no. 46151). 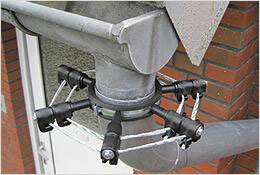 The universal mount has the advantage that you can mount the insulators vertically on the wall of the house (parallel the wall) and thus make it impossible for raccoons to climb over them. All you need for putting up the universal mount is two holes and two wood screws. 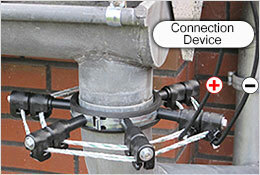 Use the 6-wire start / end insulators at the beginning and end of the fence respectively (item no. 44927). This insulator has staggered holding fixtures that ensure the wires at the start and end of the fence do not touch, which would otherwise cause a short circuit. Place a 6-wire line insulator (item no. 44928) about every 1 metre to ensure the best stability of the fence. Additional fence accessories you will need are mostly the same as those needed for securing the gutter. 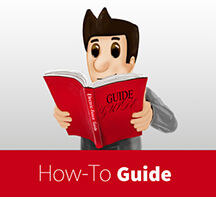 Make sure that connection from the energiser to the conducting material are carefully made using insulated high-voltage cables in order to avoid any short circuits. None of the conducting wires may be grounded when using electric fence systems attached to buildings! Two isolated wires are tensioned alternatively according to the positive / negative principle. One is connection to the fence connection (positive terminal) and the other to the ground connection (negative terminal) on the energiser. A distance of just a few centimetres between the wires makes it impossible for the raccoon to slip through without making contact with two wires at the same time and receiving an electric shock. Adjacent slat panel fences or carports are used by raccoons for getting easy access to houses. To securely block of these routes we provide special insulators with 7 parallel wires set 3 cm apart (item no. 44331 and 44332). The 7-wire insulators have a wood thread and are easily screwed to wooden materials. 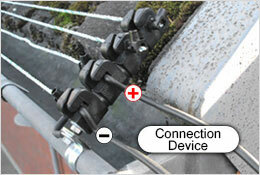 The 7-wire insulators are easily attached to stone walls using an 8 mm rawplug. 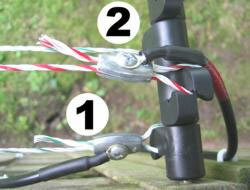 Use the 7 wire start / end insulators at the beginning and end of the fence respectively (item no. 44331). This insulator has staggered holding fixtures that ensure the wires at the start and end of the fence do not touch, which would otherwise cause a short circuit. Place a 7-wire line insulator (item no. 44332) about every 1 metre to ensure best stability of the fence. Some raccoons will also use adjacent trees to climb onto building roofs. 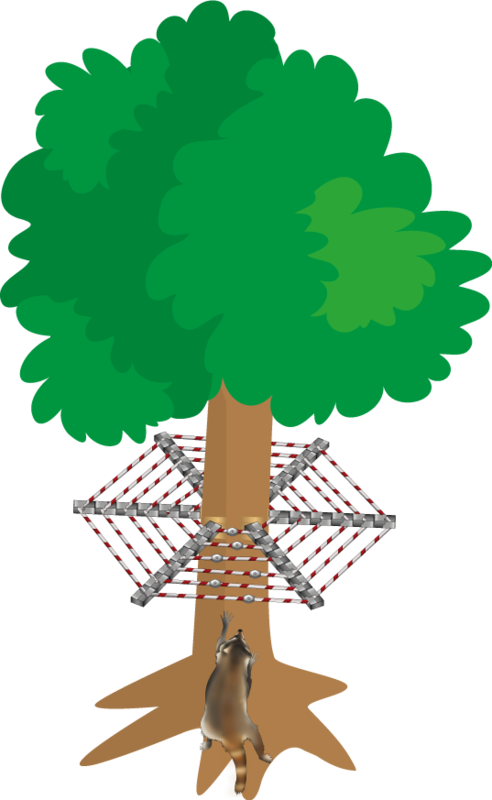 To block off this route, use the same 7-wire insulator with wood thread as for panel fences and mount these around the trunk of the tree. You can screw the insulator directly onto the tree. If you do not wish to damage the tree, screw the insulators to a piece of board attached to the tree using a tension belt. Depending on how thick the trunk is, you'll need between 5 and 10 insulators. Optimal protection is achieved by placing the insulators at a height of 1.5-1.8 m. Use the 7-wire start / end insulator at the beginning of the fence (item no. 44331). For the remainder, use 7-wire line insulators (item no. 44332). Stretch two isolated alternating wires through the insulators so that one wire circles the three 3 times and the other 4. One wire is connected to the fence connection (positive terminal) and the other to the ground connection (negative terminal) on the energiser (positive / negative principle). Additional fence accessories you will need are mostly the same as those needed for securing the gutter. Use insulated high-voltage cables in order to avoid any drops in voltage. Fish ponds are very enticing to raccoons. You have two options for reliably protecting your fish from these little furry beasts. Your first option is to put up a simple polywire electric fence with 3 rows of electric fence polywire stretched through the loops on the fence posts, blocking access to the pond for raccoons. Alternatively, you can put up electric netting that will keep raccoons away from your fish pond. Fence posts make up the basic framework for the electric fence. 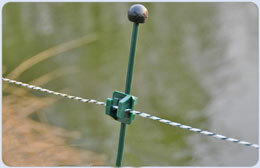 Plastic or metal posts are usually used for fences around fish ponds to protect from raccoons. These are easy to install and remove, mechanically durable and UV-stable. (item no.45606.10, item no. 44452) The garden posts (item no. 45606.10) are extremely flexible with freely adjustable insulators and are best set to heights of about 20, 30 and 40 cm for raccoon defence. Their dark green coating makes them visually perfect for gardens. If you wish to put a gate into your electric fence or include corners in your plan, then you should use a permanent fence post at these points such as the Allround Metal Post (item no. 44386) so as to ensure the fence remains stable. 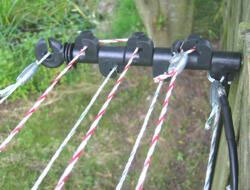 The insulators are attached to these using metric screw threads (item no. 44327) at 3 heights at which the conducting material will run. Polywire is a particularly suitable conducting material, providing very high conductance thanks to the use of high-quality stainless steel and copper (item nos. : 44645, 44509, 42405). Feed the wire through the eyelets of your flexible posts and through the insulators and mount these at the start and end of the fence. To prevent any loss of current, do not put any knots in your conducting material. Instead, use connectors (e.g. item no. 44684, 44751) to hold the wire in place. Connectors will make it easier to re-tension the fence later on, and will also protect the conducting material. As with any electric fence, stranded wire fences need a good grounding connection. For this reason, a good grounding stake should be used to provide a route for the current back to the energiser (item nos. 44219, 44307, 44375).To ensure clean conductive If the ground conditions are particularly poor, e.g. sandy, dry soil, it may be necessary to use several grounding posts. Connect these together using a highly conductive corrosion-resistant wire (ideally galvanised steel wire or lead out cable e.g. item no. 32601). Wild animals like raccoons are considered "difficult to deal with". High-performance energisers at around 4,000 V are usually used. However, raccoons will usually touch the fence using their sensitive noses and paws. As such, voltages of around 3,000 V are sufficient. The 230 V Energiser "NV 1100" (item no. 42100) meets this requirement and is therefore perfectly suited for defence against raccoons. This mains energiser has been specially designed for shorter fences and is perfectly suited for smaller fish ponds with low levels of vegetation. The "NV 1100" is very easy to use and is therefore a great choice for those new to electric fences. If it's a very large pond that you need to protect, then we recommend the "Extra Power 230 V" (item no. 42110). The "Extra Power 230 V" reliably and safely provides the required voltage even along lengthy sections of fence and where there is light vegetation. Insurers recommend installing a ground fault circuit breaker (item no. 48015) when using mains energisers in the home, yard or garden. This is placed between the energiser and plug socket. The energiser is instantly turned off the moment any fault currents are detected. Fault currents may be caused by defective cable insulators or moisture damage. Using a ground fault circuit breaker will avoid any accidents involving electricity. If no mains connection is available, then you will want the 12 V battery energiser "Green Energy" (item no. 44186). This is fitted with modern battery saving technology and automatically adapts itself to the condition of your fence. As well as being battery powered, this energiser also has connections for mains and solar power supplies - making it extremely flexible. For longer fences (> 1000 m) or areas with vegetation, we recommend the "AV 6500" battery energiser (item no. 42060). The "AV 6500" is very powerful, can be easily attached using the crocodile clips and comes with an indicator light so that you can quickly see that the fence is in working order. Available power supplies for battery powered energisers are either the 12 V wet battery (item no. 34461), which is the same as a car battery, or a solar panel (item no. 44412, 44465). To ensure clean conductive connections in your electric fence you should ideally use a lead out and fence connector cable (item no. 44300 and 44407) as well as polywire connectors (item no. 44619). (Lead out and fence connector cables are included with the "AV6500"). Using a fence tester you can quickly and reliably determine how well your fence system is working. Digital testers are especially convenient. (item no. 44863). To ensure an effective deterrent, the operating voltage should be at least 3,000 V.
For safety purposes, lightning protection equipment should also be installed (item no. 44755). This will prevent lightning strikes from affecting your energiser during a storm which would otherwise lead to irreparable damage. If your energiser is installed inside a building, then lightning protection may be legally required in accordance with your local regulations. The lightning protection mechanism is installed between the energiser and the conducting fence material. First mount the lightning protection mechanism onto a non-flammable surface near to your energiser (e.g. on a wall of the house). Next, connect it to the energiser's fence connection using a high voltage insulated fence supply cable (item no. 32615). The other part of your lightning protection mechanism is connected to the polywire using a high voltage insulated fence supply cable. For the grounding connection you should ideally use a galvanised steal core lead out cable (item no. 32601). Use this cable to connect the lightning protection mechanism to the grounding stake. It is a legal requirement that any electric fence systems placed near to public roads and pathways are clearly indicated by a warning sign according. Attach clearly visible warning signs at a recommended interval of 10m to 50m, but not exceeding 90m and at entrances to paths and locations where an electric fence may not be expected carrying the phrase "Electric Fence" (item no. 44842).